WataugaWatch: Republican Voters in NC House District 67 Say "No, Thanks"
Republican Voters in NC House District 67 Say "No, Thanks"
I've been too wrapped up in gardening work to even notice that NC House Rep. Justin Burr of Stanly County lost his primary race to an unknown. Whaaa? 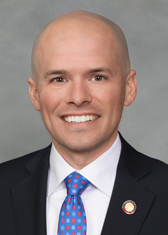 Justin Burr is the Lex Luthor look-alike and act-alike who most recently was the chief sponsor of the attempt to turn the North Carolina judiciary into a partisan tool for Republicans. Stanley County pharmacist Wayne Sasser beat the six-term Burr easily with 56% of the vote, running on only two issues -- the opioid crisis and getting broadband into rural areas -- and no campaign infrastructure to speak of. He comes across as a kindly older gentleman, and Justin Burr was not. House District 67 is rated strong Republican, and Wayne Sasser is going to be its next rep in Raleigh. There's a Democrat -- Karen Webster -- on the ballot, but as far as I can tell, she's just a name on the ballot and otherwise wholly invisible. Too bad! Since, if there ever was a year for more surprises than just seeing Justin Burr lose his primary, this is the year. But you can't win an election if you don't run. Who Is This Man, and Why Is He So Happy?